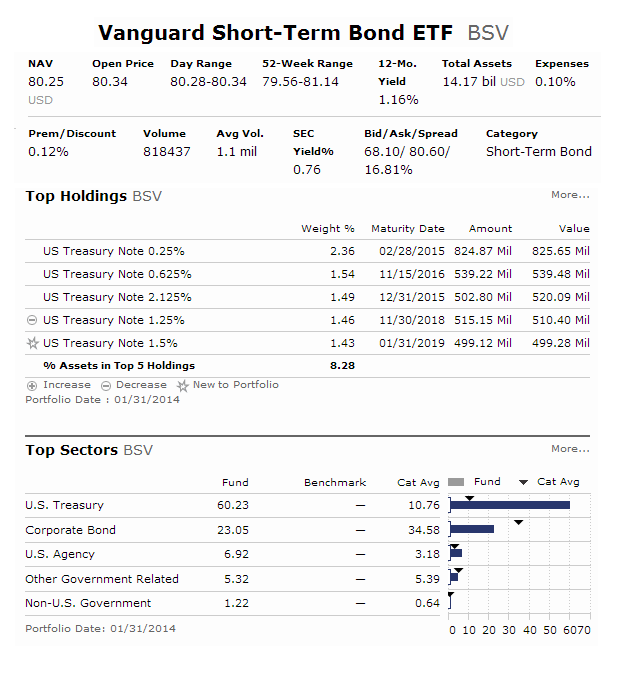 Find ads of Vanguard Short-Term Bond ETF (BSV). This fund is an index exchange traded fund. This fund invests in short duration bonds including U.S. Treasuries and corporate debts. Vanguard Group is known for its index mutual funds. This low cost mutual fund provider has introduced various exchange traded funds. These ETFs has low expense ratio fee. Vanguard provides stock ETFs, and bond ETFs. Some of the popular ETFs are Vanguard S&P 500 ETF (VOO), Vanguard FTSE Emerging Markets ETF (VWO), Vanguard Total Stock Market ETF (VTI), Vanguard Total Bond Market ETF (BND), etc. 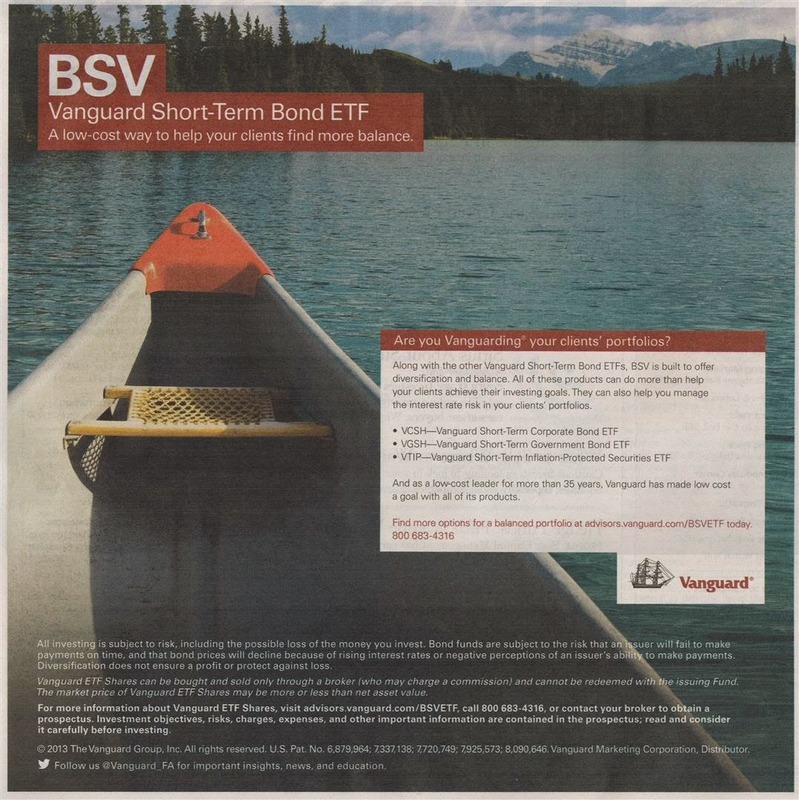 Recently, Vanguard Group provides an investment ad about Vanguard BSV - Vanguard Short-Term Bond ETF. You can buy this fixed income fund through your brokerage for your investment account or retirement account (Roth IRA or Traditional IRA). Find this index bond fund review below. Along with the other Vanguard Short-Term Bond ETFs, BSV is built to offer diversification and balance. All of these products can do more than help your clients achieve their investing goals. They can also help you manage the interest rate risk in your clients’ portfolios. And as a low-cost leader for more than 35 years, Vanguard has made low cost a goal with all of its products. Find more options for a balanced portfolio at advisors.vanguard.com/BSVETF today. This Vanguard fund seeks to track the performance of the Barclays U.S. 1-5 Year Government/ Credit Float Adjusted Index. This exchange traded fund follows a passively managed, index sampling approach. The expense ratio is only 0.10% per year. This fee is 88% lower than the average expense ratio of funds with similar holdings. This bond exchange traded fund has total net assets of $13.99 billion. The 12-month yield is 1.18%. The fund is currently traded at premium 0.05% from its NAV. The Vanguard Short-Term Bond ETF fund is rated with 2-stars rating from Morningstar. Since the inception in 2007, the fund has its highest return in 2008 with 8.47% and the lowest in 2013 with 0.16%. The YTD return is 0.60%. The average maturity and average duration are 2.7 years. It has a total of 1794 bonds. While the fund is ranked with low rating by Morningstar, you can invest in this ETF with ease due to low cost index approach. If you are worried about rising interest rate, you can invest in this short term bond ETF.